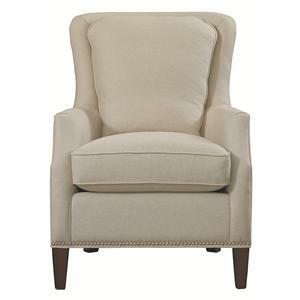 This casual styled accent chair comes from a manufacturer with a reputation for well crafted custom upholstery. The piece features tapered wood legs for a look that is not over-adorned. The seat back and arms are decorative with simple lines. 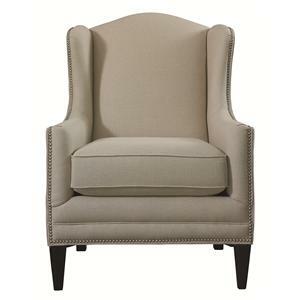 Blend this chair with your casual, transitional or modern room display. The seat cushion is tailored with welt cord trim that offers a finishing touch to the chair. 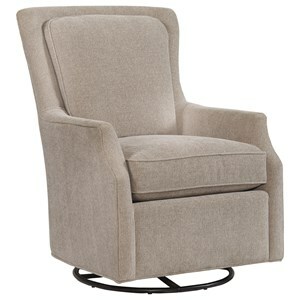 The Accent Chairs Corina Accent Chair with Casual Style by Bassett at VanDrie Home Furnishings in the Cadillac, Traverse City, Big Rapids, Houghton Lake and Northern Michigan area. Product availability may vary. Contact us for the most current availability on this product. Arm Downward slanting arms with a simple style. Seat Back Attached seat back for a sleek and sophisticated look. Seat Plush seat cushion with welt cord accent trim. Leg or Skirt Exposed wood legs in a casual tapered style.